Roughly the size of Singapore, Pulau Samosir (Samosir Island) is a peaceful island situated within Sumatra's Lake Toba -- the largest volcanic lake in the world. Pulau Samosir was formed by the cone of a new volcano that rose up from the lake floor. Today, the island offers some fresh air, relaxation, and even headhunter culture for travelers who could use a break from Sumatra's bumpy roads. With gorgeous scenery, freshwater swimming in a naturally heated lake, and friendly Batak people, Pulau Samosir is the kind of hard-to-leave place that destroys itineraries! 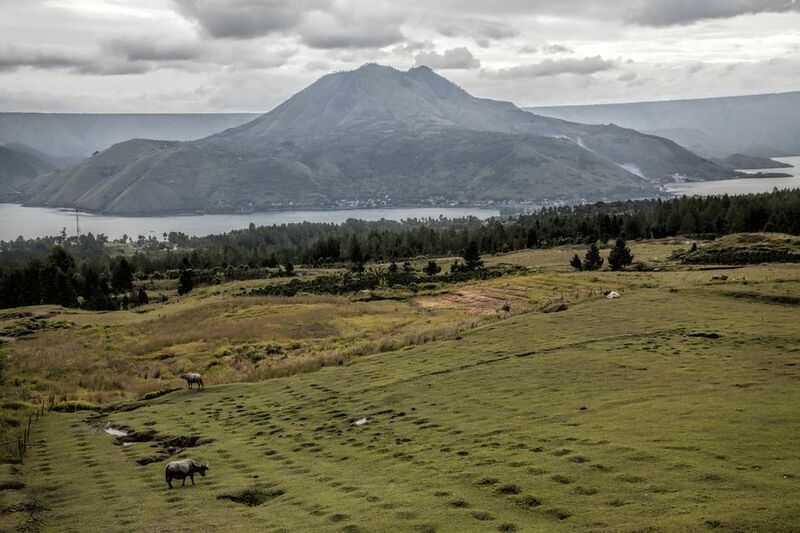 The summer months are typically the driest and are high season for Lake Toba and Pulau Samosir, although the entire area is in a major tourism slump at the moment. ​July is the peak of the busy season. The primary tourist area on Pulau Samosir is a knob of land jutting from the island known as Tuk-tuk. A single road runs around Tuk-tuk in a complete circle; Tuk-tuk can be circumnavigated in around an hour on foot. One main road circles Pulau Samosir, while many poorly maintained roads crisscross through the island interior. Tuk-tuk is reached by boat; ferries run regularly from the mainland and drop passengers at the guesthouses of their choice. Much to the shock of backpackers arriving by boat, guesthouses on Pulau Samosir tend to be large, resort-like affairs with rooms offering beautiful views of the lake. Don't be put off by the sanitized, package-holiday appearance -- clean rooms with a lake view can be found for between $6 - $15 per night! There are so many things to do at Lake Toba. Aside from the obvious allure of swimming in pleasant, volcano-heated water, Pulau Samosir is home to a fascinating, ancient people known as the Bataks. The Batak people are among the friendliest locals in Indonesia; guitar jams and impromptu singing parties are a daily occurrence around the island. Pulau Samosir is the perfect locale for interaction with locals; all are far more welcoming in modern times than their cannibalistic, headhunting ancestors! Learn how to say hello to them in Indonesian before your trip. Bagus Bay and Samosir Cottages both have traditional Batak dance and music on Saturday nights. Grabbing a motorbike to explore ancient Batak ruins and villages dotted around the island is certainly an unforgettable adventure. One ATM can be found in Tomok and another in Ambarita -- around three miles northwest on the main road from the entrance gate to Tuk-tuk. The ATMs often run out of cash or are broken for weeks at a time -- bring enough local currency with you. Internet access can be found in a few cafes, or some of the larger guesthouses have Wi-Fi for customers. Samosir Cottages' airy restaurant is a good bet for Wi-Fi. The voltage on Pulau Samosir is 220-volts with the round, two-pronged European-style plugs. Read more about the voltage in Asia. The neighboring village of Tomok -- around three miles southeast of Tul-tuk -- is the place for souvenir shopping. Be warned: many of the items claimed to be made locally are not. Read more about responsible travel and see some tips to avoid scams while shopping. Pulau Samosir is the place to eat your fill of fresh lake fish; try Jenny's Restaurant for great, nightly grilled fish. Learn about eating in Indonesia and see some great Indonesian food to try. Pulau Samosir is one of the most scenic and enjoyable places to ride a motorbike in all of Indonesia. Motorbike is the best way to bounce between small, Batak sites of interest; most of the road around the island is in fair condition. A rental is negotiable based on the number of days, but typically costs around $7 per day and includes a full tank of petrol. Local license and helmet laws are not enforced on Pulau Samosir. Alternatively, public minibusses sporadically ply the main road around the island; flag one down and pay based on the distance that you travel. Minibuses will drop you at the entrance of Tuk-tuk; depending on where you stay, expect to walk two miles or more from the gate to your guesthouse. Pulau Samosir is roughly five hours by minibus -- depending on traffic -- from Medan. Travelers arrive at the harbor in the port town of Parapat; ferries leave Parapat every hour until 6 p.m. Boats conveniently circulate Pulau Samosir and drop people at the larger guesthouses and resorts around the island. If coming from Bukit Lawang, private cars ($15) leave every morning around 8 a.m.; the journey takes close to eight hours. Read about other places to go in North Sumatra.